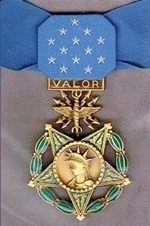 Medal of Honor Citation: George Andrew Davis, Jr.
Rank and organization: Major, U.S. Air Force, CO, 334th Fighter Squadron, 4th Fighter Group, 5th Air Force. Place and date: Near Sinuiju-Yalu River area, Korea, 10 February 1952. Entered service at: Lubbock, Tex. Born: 1 December 1920, Dublin, Tex. Citation: Maj. Davis distinguished himself by conspicuous gallantry and intrepidity at the risk of his life above and beyond the call of duty. While leading a flight of 4 F-86 Saberjets on a combat aerial patrol mission near the Manchurian border, Maj. Davis’ element leader ran out of oxygen and was forced to retire from the flight with his wingman accompanying him. Maj. Davis and the remaining F-86’s continued the mission and sighted a formation of approximately 12 enemy MIG-15 aircraft speeding southward toward an area where friendly fighter-bombers were conducting low level operations against the Communist lines of communications. With selfless disregard for the numerical superiority of the enemy, Maj. Davis positioned his 2 aircraft, then dove at the MIG formation. While speeding through the formation from the rear he singled out a MIG-15 and destroyed it with a concentrated burst of fire. Although he was now under continuous fire from the enemy fighters to his rear, Maj. Davis sustained his attack. He fired at another MIG-15 which, bursting into smoke and flames, went into a vertical dive. Rather than maintain his superior speed and evade the enemy fire being concentrated on him, he elected to reduce his speed and sought out still a third MIG-15. During this latest attack his aircraft sustained a direct hit, went out of control, then crashed into a mountain 30 miles south of the Yalu River. Maj. Davis’ bold attack completely disrupted the enemy formation, permitting the friendly fighter-bombers to successfully complete their interdiction mission. Maj. Davis, by his indomitable fighting spirit, heroic aggressiveness, and superb courage in engaging the enemy against formidable odds exemplified valor at its highest.